It’s not merely a blast from the past- soaker tubs are coming back into style. They create a luxurious experience that has a design to fit every style from traditional to the most modern. If your dream is to incorporate a soaker tub into your bathroom redesign, you can find the one that’s just right for you here. 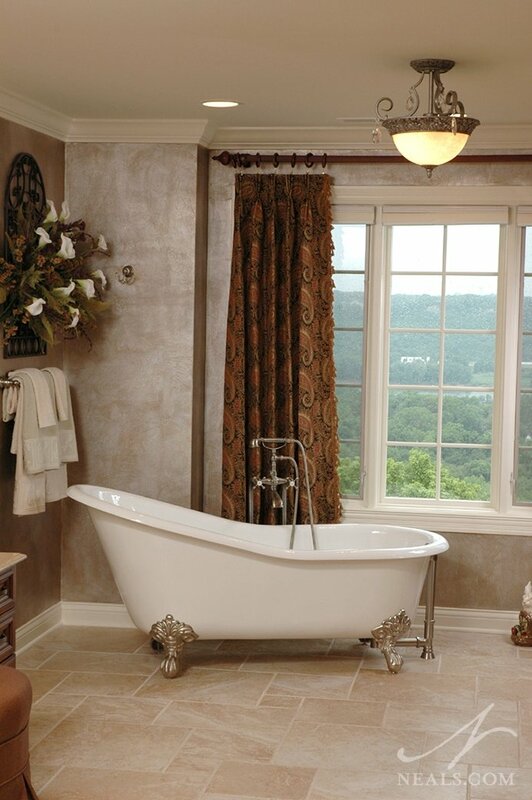 This Free-Standing tub is a beautiful fusion of traditional and modern styles. A solid base and classic fixtures create a sophisticated piece to use in your bathroom remodel. As the name implies; these tubs stand away from the wall, as an independent piece. Free-standing tubs can make a huge statement in your bath. The tubs can have legs or a solid base. These two designs are clawfoot and solid base tubs. Slipper tubs are a subcategory of free-standing tubs, so any free-standing tub can be a slipper style. This clawfoot tub beautifully showcases the distinctive feet that gives the tub its name. A clawfooot tub is the classic free-standing tub that most people think of - four short legs that usually resemble the foot of an animal. Most commonly the design of the feet feature a cat-like paw with claws bared. 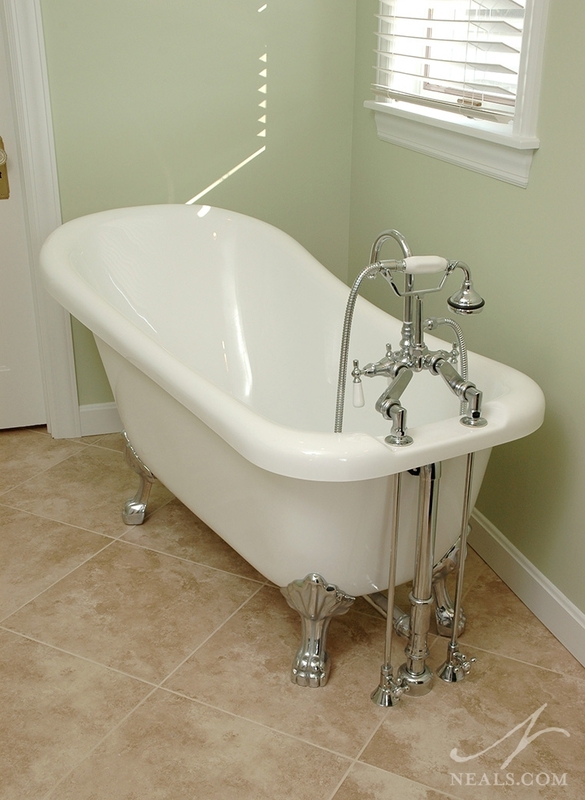 This style of tub has been around since the 1800s, so they can add a classic feel to the space. Traditionally, this style is more round in shape and known to be especially deep. A solid base tub has a more modern and contemporary feel and, like this one, can come in many unique designs. If the clawfoot design is too traditional for your tastes, solid-base tubs have a more modern feel. The solid base may have a wider range of designs than clawfoot soakers, since they can be created to be more contemporary or traditional in style. Models come in round and curvy or straighter edge rectangular shapes. This classic slipper clawfoot free-standing tub showcases the traditional design perfectly with one end of the tub sitting higher than the front and the accented legs evoke a sense of style and comfort. Any free-standing tub can be designed as a slipper tub. Slipper tubs include a higher side on one end. This allows you to rest your back and neck more comfortably, facilitating that relaxing, “I could stay here for hours” experience. Slippers can be found with either legs or a solid base. Drop-in tubs fit inside a deck or frame that can be designed to match seamlessly with the room. With Drop-Ins the tub itself is placed inside a frame or deck that can then be customized to match the cabinetry or tiles in the bath. These can be placed in a bay, niche, or even be a freestanding element but require quite a bit of floor space. Alcove tubs, like this contemporary example, are placed within three walls with only the front side exposed. Soaker tubs can be surrounded by two or three walls, in the same way as a tub that also features a shower. They feature a finished front, while the other sides are hidden by the surrounding walls. Alcove tubs do not always need to be placed in a frame or deck like Drop-In tubs do, but they do not stand alone like Free-Standing tubs. While this style is most commonly seen in tub-shower combinations, the soaker tub is designed to relax and soak in. 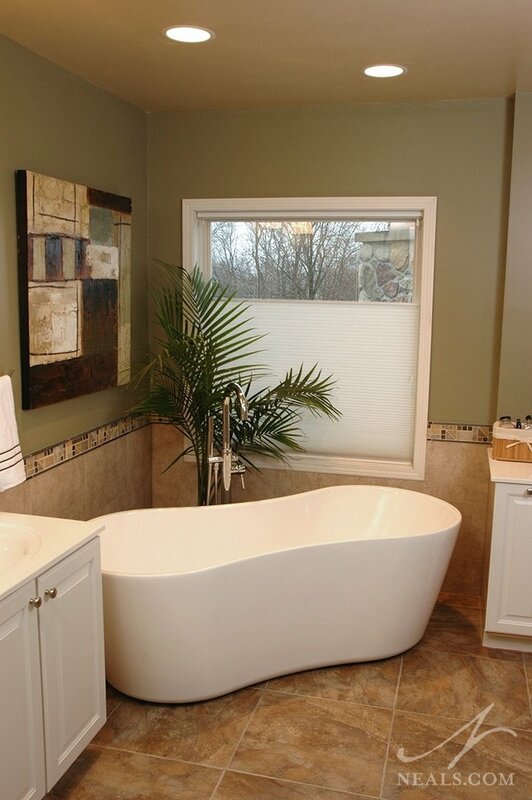 An alcove tub is something to consider to play up the aesthetics when choosing your soaker tub. Alcove designs take up less space and are commonly used in many homes already. Requiring only two walls, these tubs come in different shapes and sizes to accommodate the corner of your bathroom. Corner tubs offer a unique spin to a home. Placing a tub in the corner can take up a bit more floor space, but only requires two walls instead of three like a traditional tub and shower combo. The most common shape for these tubs is two edges that fit into the corner and a curved front. It is also possible to find this style in shapes that are more circular or oval, as well as Drop-In versions and tubs with finished fronts like some alcove tubs. 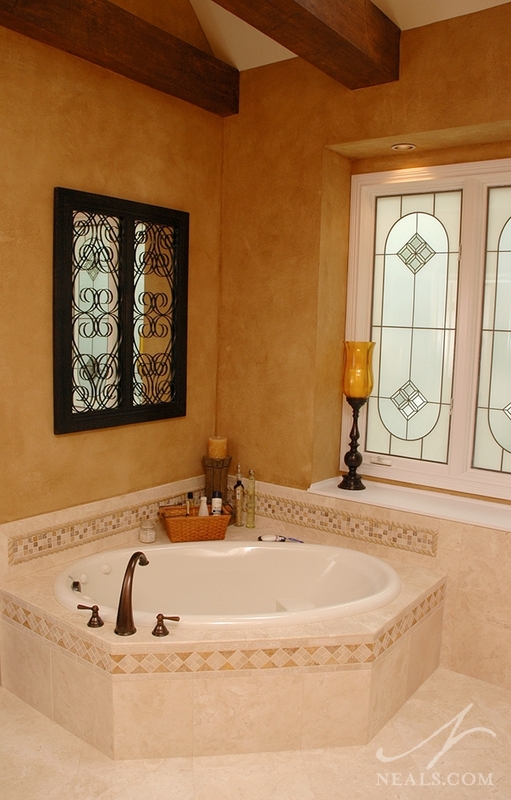 Whether you prefer Air or Water jet tubs, this style will allow you to do more than just fill the tub with water. Add an extra level of comfort to your soaker tub by selecting one with water or air jets. While water jets recycle water in the tub, air jets push air through the existing water. Both provide a relaxing and rejuvenating effect for tired achy muscles. Air jet tubs allow you to have a larger number of jets and the ability to add elements (such as flower petals) to your bath, since water does not enter or exit the jets. Water jets are able to open or close more to control the pressure coming out of them. After you have found the best style of soaker tub for you, consider the material you want the tub to be made from. Depending on how often you will use your tub, what material fits the style of the whole bathroom, and how much you are willing to spend, you have several options. 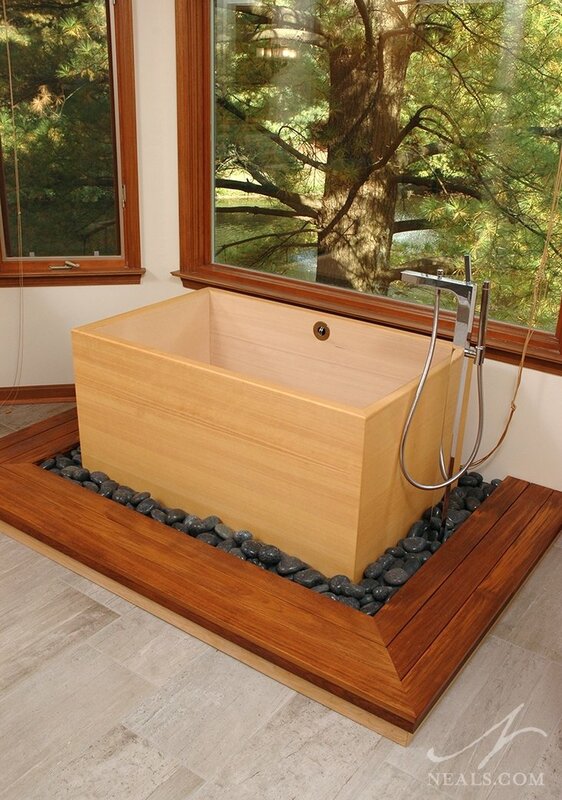 This Japanese-style soaker tub made from Hinoki wood brings a natural feel to this relaxation oasis. 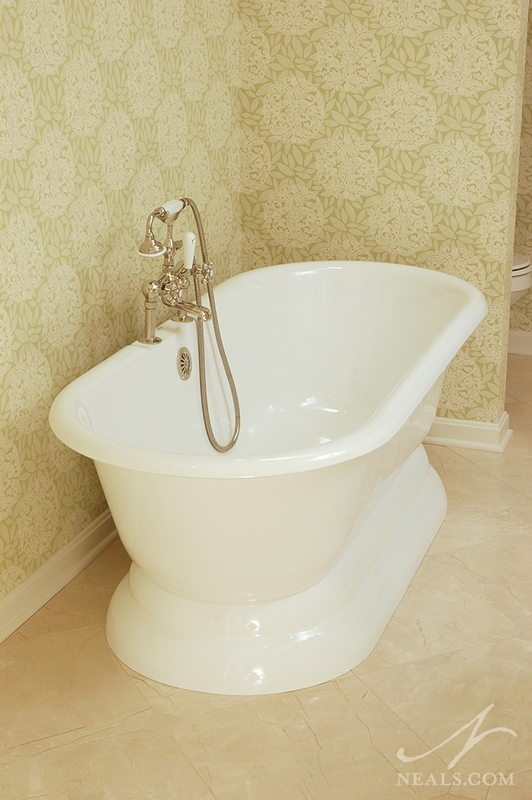 The most popular materials used for tubs are Acrylic and Fiberglass. These are also the least expensive options. They come in a variety of colors and offer a more traditional and customizable appearance for your space and can be found in more styles than others. Cast Iron tubs are most conducive to heat retention so your water will stay warmer slighty longer. While still available in many colors, these tubs are much heavier than the Acrylic or Fiberglass options. Enameled Steel is lighter and more resistant to scratches and stains than Cast Iron, but steel conducts heat, so water will cool faster in these tubs. 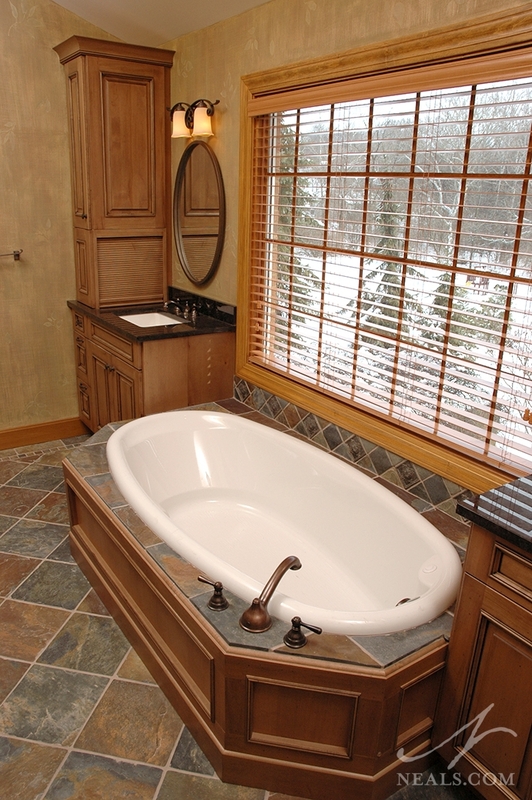 Tubs can be carved from natural stone and wood like limestone or mahogany. You’ll want this to be a Freestanding tub so that the natural beauty can be showcased from all angles. Marble will also be a beautiful and smooth finish to any tub. While a more expensive option, it will add a lavish feel to your bath. Copper tubs can also make a statement right away. Rustic, yet refined, they can be a great focal point for the room. 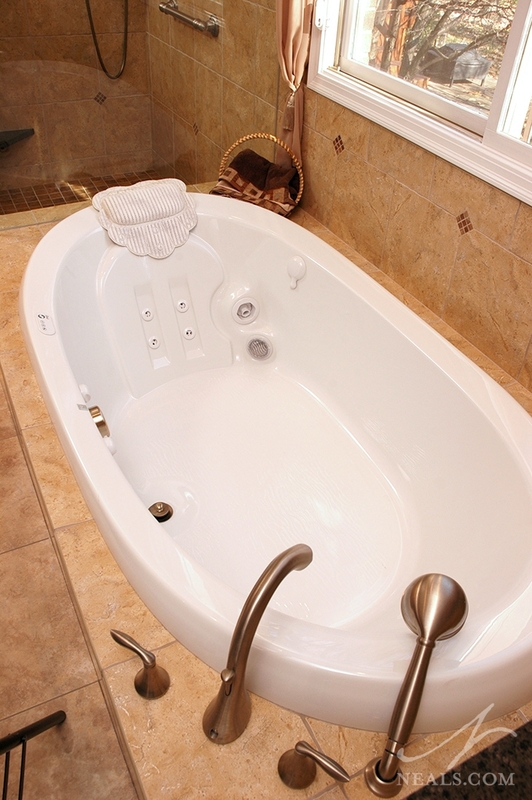 Soaking tubs are designed to hold a considerable amount of water, so safety is a primary factor. 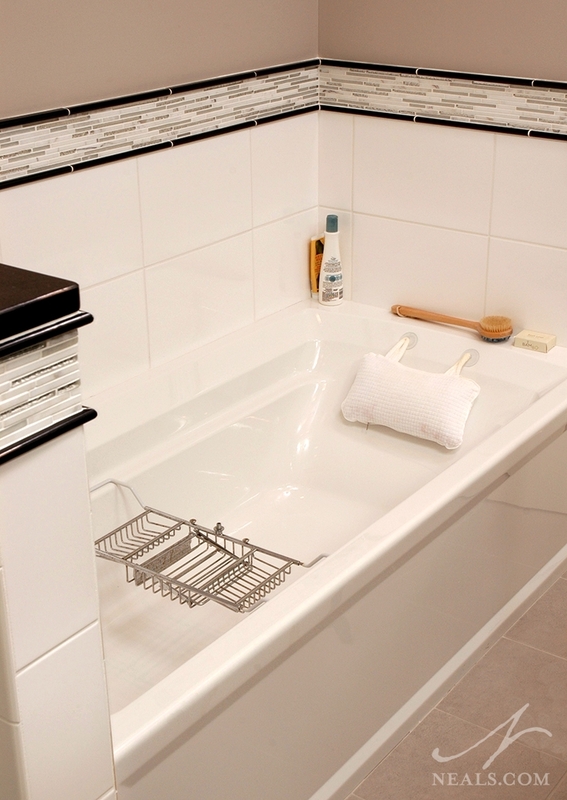 Check to see if the tub you are considering comes with a slip-resistant floor or can accommodate handles. Also, be sure to make sure the floor is able to handle the weight of the tub once it is filled. If possible, test getting into and out of the tub before your purchase to ensure that the tub is sized properly for you, or to identify if you may need a grab bar nearby.